Ask the Supplement Expert: Is Native Whey Legit? What does native whey or undenatured whey protein mean, and is this better than other kinds of whey protein isolate? Supplement expert Chris Lockwood sets the record straight. Q: I often see protein supplements containing "native" and "undenatured" whey protein. Do I need these in my diet to get good results and be safe? The short answer: Based on everything we know right now, no, so-called undenatured whey protein isn't any better. That answer needs a fair amount of unpacking, however, because the term "native" brings to mind all kinds of associations with nature, purity, and nutrition that's untampered by human processes. But, those ideas don't always jive with the requirements of the commercial dairy industry that produces whey protein in the first place. In dairy processing, the casein and whey proteins can be separated using a number of different approaches, each with their own pros and cons. 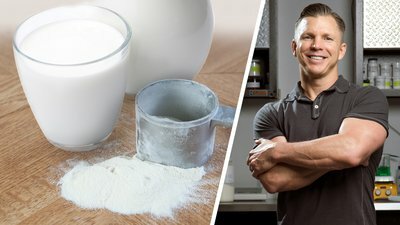 So as not to make this too confusing, just know that whey proteins marketed as "native whey" have been produced using a specific filtration technique that separates the micellar casein and whey fractions directly from milk. A more accurate name for the whey protein collected using this method is "microfiltration permeate." Before getting into the details of what specifically differentiates protein ingredients marketed as "native whey protein" versus other forms of whey protein concentrate and isolate, there's one common misuse of the term "native whey" that should also be corrected: Proteins that haven't been hydrolyzed, or broken down into smaller peptides and fragments, are often inaccurately categorized as "native protein." Instead, all non-hydrolyzed proteins should be referred to as "intact protein." In other words, all non-hydrolyzed whey protein concentrates and isolates, regardless of the processing, can generically be categorized as "intact whey." They're not all native, though. The two terms aren't interchangeable, but in some marketing, they're treated that way. With that clarified, let's go native. For all commercial dairy proteins on the market, the milk used has been pasteurized to protect against harmful bacteria. This is true whether it's "native whey," whether the whey protein isolate was separated from casein by adjusting the pH ("acid whey"), by disrupting the casein micelles using enzymes ("rennet whey"), by using positive and negative chemical charges to "extract" the whey proteins ("ion exchange whey"), or by any of the other processes available. In almost all cases, the milk has been homogenized to make the fat droplets more evenly distributed, and then skimmed to remove the fat. Why is all of that important for you to know? The processes of homogenizing, pasteurizing, or removing fat from milk significantly affects the composition and structure of the proteins derived from that milk. Yep, that's right; all whey has been denatured to some extent and is no longer in its raw, native state by the time it leaves the dairy processing facility. For example, one recent study showed that simply homogenizing raw whole milk has a significant destructive (denaturing) effect on the structural stability of whey proteins. It was as significant as pasteurizing the milk, or both processes combined! Skimming the milk—or removing some of the fat—and pasteurizing it was even more destructive on the proteins and found to be as damaging as ultra-high temperature pasteurization. The most damaging of the methods tested, predictably, was the combination of homogenization plus ultra-high temperature pasteurization. The upshot for you: If your "native" undenatured whey protein is coming from skim milk, homogenized milk, or pasteurized milk, it ain't so native anymore. So, here's the moral of the story: Unless you're getting your whey protein from raw milk that is full-fat, non-homogenized, and unpasteurized, your protein is no longer identical to its composition when it was present within its raw milk state. Undenatured whey protein isn't technically undenatured. A couple of caveats: I'm not saying there may not be unique benefits to using one processed form of whey versus another. And to be clear, I'm also not saying that native whey protein isn't an effective form of whey. I just doubt, based on what we currently know, that it's any better than other forms of whey protein isolate. The process used to make native whey protein isolate does tend to yield about 20 percent more of the amino acids leucine and lysine per 100 grams of the final whey powder than what is found in an acid or rennet isolate. However, the same microfiltration process that preserves amino acids also removes all of the whey microfractions known as glycomacropeptides. Immunoglobulins and lactoferrin may also be removed by the native whey process. To see if any of that matters in resistance-trained, college-aged students, researchers in Oslo, Norway, compared the effects of consuming two 20-gram doses of protein from native whey, rennet whey, and milk-protein concentrate (20 percent whey, 80 percent casein). As one would expect, blood concentrations of leucine (the amino acid that turns on the muscle building process) were highest in response to the native whey. However, over the 5-hour supplementation period post-exercise, both whey treatments yielded identical responses in total BCAAs (the combination of amino acids leucine, isoleucine, and valine) and total essential amino acids (EAAs) in the blood. Both whey groups were significantly more effective at elevating total EAAs, BCAAs, leucine, and isoleucine in the blood than what occurred in response to the milk protein supplement. Muscle-protein synthesis responses were statistically similar over the 5-hour period in response to either form of whey. There were no real differences in performance-based muscle recovery for up to 24 hours after the prior day's testing among any of the three cohorts. In other words, thus far, the term "native" currently carries more marketing cachet than proof. From where I stand, the upside is about the same as…whey. Both types will give you the amino acids you need in your diet to build muscle. The day may also eventually come‎ when someone will actually figure out how to extract and purify whey directly from raw, fresh milk processed without the use of heat or the need to homogenize. Then, we'll really have native proteins. Until then, don't believe everything you read on a bottle. Learn how whey protein affects your hormones. Untangle the controversy about whether too much whey protein is dangerous. Qi, P. X., Ren, D., Xiao, Y., & Tomasula, P. M. (2015). Effect of homogenization and pasteurization on the structure and stability of whey protein in milk. Journal of Dairy Science, 98(5), 2884-2897. Heino, A. (2010). Microfiltration in cheese and whey processing. Hamarsland, H., Nordengen, A. L., Aas, S. N., Holte, K., Garthe, I., Paulsen, G., ... & Raastad, T. (2017). Native whey protein with high levels of leucine results in similar post-exercise muscular anabolic responses as regular whey protein: a randomized controlled trial. Journal of the International Society of Sports Nutrition, 14(1), 43.